We have seen glimpses of the latest TravelSound i85 at the recent CES. Now it's officially released for the European region in an exclusive deal with Argos. 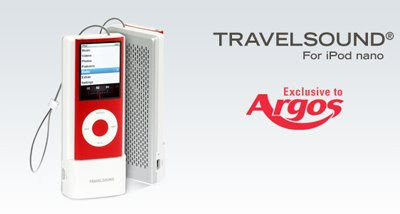 The i85 will dock the iPod Nano 4th Generation perfectly and will enable the in-built FM Radio function of the iPod Nano. Besides a battery life of 15 hours, it is also able to sync and charge the iPod when connected to the computer. What I like best about this TravelSound is the in-built re-chargeable battery and the lanyard which double up as an antenna for the player.